Many years ago I spent a few months in Europe on an exchange program - in Austria, to be specific. November 2nd, or All Soul’s Day, is a big deal for much of Western Europe. In fact, it’s something akin to our Thanksgiving. Many living away from home travel home for meals and prayers and an assortment of special traditions, one of which includes a trip to the local graveyard to leave candles and flowers on the graves of loved ones who have passed away. I remember visiting the graveyard on that day years ago. I’ve never seen a cemetery look so beautiful. It was a sea of stones, flowers and twinkle lights. It was a striking contradiction - something representing the permanence and cold finality of death being decorated to look so beautiful and inviting. But it was, and is, a really good metaphor for the liturgical reality we’re celebrating today. The tradition of remembering and honouring the souls of the faithfully departed, especially those of our own families, is important because we’re all headed in that direction. Someday we are all going to die. 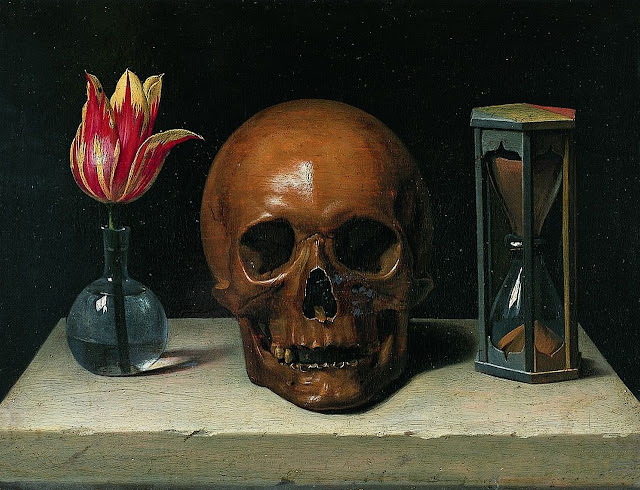 And death – something that the Pagan world sees as distressing, grim or macabre - for us Catholic Christians, has “lost much of its terror in the mystery of the death of Christ. The New Testament speaks with almost startling insistence of Christ’s triumph over death. “Where then, death, is thy victory; where, death, is they sting?” (1Cor.15:55) It is a cry of joy. …By his death and glorification our Lord has brought death to naught, has trampled upon it, so that for the just there is no more death, but everlasting life.” (Manual of Catholic Prayers, p. 430) This day, November 2nd, which celebrates those who have died – our friends and family in Christ - in actual fact, celebrates the life they now live in Christ and because of Christ. While I was in Austria, I lived in a 13th century Carthusian Monastery that had been converted into a hotel/dormitory. On the walls of the buildings remained the faded fresco’s that had once been painted by the monks – paintings of life-like skeletons in habits and skulls and bones, with the words “Frater Momento Mori” underneath, which means “Brother, Remember Your Death” in Latin. The idea, we were told, was that the monks lived their lives in constant recollection of where they were going, living every moment with their eyes set on Jesus, the final prize. In every mouthful they consumed, in every piece of wood they chopped, they would see God’s Will and strove to choose to do what God expected them to do in all things, big and small. The Carthusian Monks when they died were buried beneath the church, in a ‘mass’ grave of sorts. There were only a set number of graves so that when a brother died, the living brothers would dig the “next” grave and bury him in it. It was often found that the “next” grave would contain an incorrupt body – a classic sign to us here on earth that the soul of the man was living with God in heaven as a saint - and the monks, such was their humility, would merely cover that body up and dig the “next” grave. Great post! We really need to be more joyful at the prospect of death. I thought that the homily yesterday was fabulous, especially the reminder that we will be shown all the things we did or didn't say or do and how they hurt people. Ouch.